Susan Louis (pictured right) was the guild's Quilter of the Month in October 2004 and October 2010. A member of the guild since 1991, she was also our President from 1995 to 1999. A constant Empire Quiltersbooster and volunteer for charitable and craft-promoting efforts, this pro also teaches quilting at all levels — in the public schools, at senior organizations, and to folks in the mainstream communities. Sometime in the mid-1980's Susan Louis went for a tarot card reading. The woman reading the cards indicated that Susan would be doing what she was meant to be doing come April or May of the following year. Now, more than 20 years later, Susan is a very passionate quilting addict! She has traveled extensively on quilt related trips, taught in France and Russia as well as many venues here in the US. Susan has also exhibited her work here and abroad. Susan is an eclectic quilter who likes to try many different techniques and experiment with color. 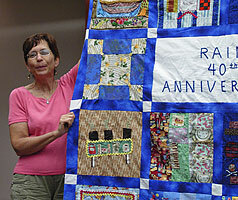 Quilting has not only been a tremendous creative and social mainstay but has seen her through some very tough times. And quilting satisfies her need to collect fabric!